How do I prevent bridges while soldering SMD Components? 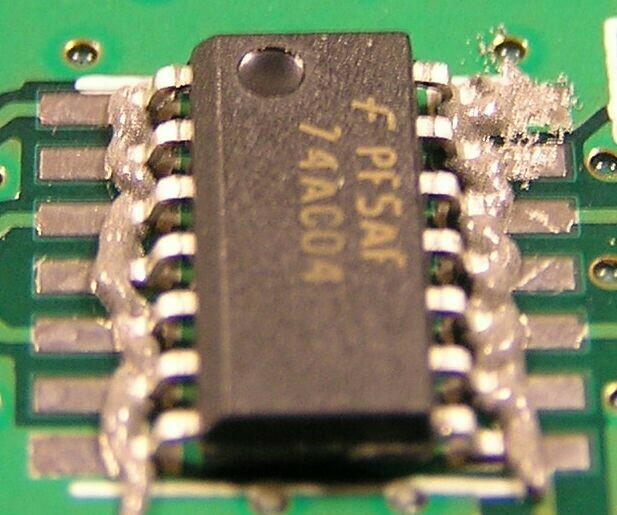 I have noticed that whenever I try to solder a component with many pins close together (like an IC), I get tiny bridges of solder, which shorts the pins. Is there any easy way to solder SMDs without solder bridges? When soldering by hand, it is easier and faster to just ignore the bridges while you solder the part and then clean it up. Just put some desoldering wick on the bridge, heat with your soldering iron (may need a bigger tip or more heat) and the excess solder will happily flow into the wick leaving perfect solder joints. With practice the cleaning of even large parts just takes a few seconds. There are three golden rules in hand soldering: 1. Use a lot of flux; 2. Use more flux; 3. Use even more flux. Rosin-based mildly-activated flux (RMA type) helps a lot. And, of course, right iron power, clean tinned tip, sharp tip (I prefer), and right iron temperature for the solder you are using. Forget the old soldering iron method. Solder paste (and a heat gun) is your friend. This method is MUCH easier and faster than soldering each connection! Put a small (appropriate) quantity of solder paste on each pad; for ICs, you can put a continuous line of paste across all the pads on both sides. Heat the underside of the board with a heat gun. All the components will be simultaneously and neatly soldered in seconds, with no solder bridges and much better looking than with an iron! I bought mine from http://kd5ssj.com/solderpaste. The technique. A video there showing how it's done, but there are much better videos on YouTube. 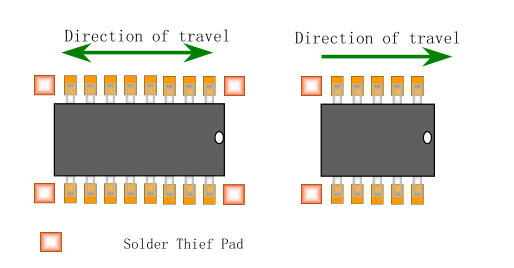 If you design the PCB by yourself you could make a "solder thief pad" also used in wavesoldering. this extrapad will take all the excess tin. In addition you should use lot of flux. I would recommend you to try diffrent brands and find the best one for you. You can also try to use gull wing soldertips. I have one by myself and with the right flux i rarely have to clean up with solder braid. But when i have to, it isn't the end of the world. Clean the tip from excess solder, add flux and just slide iron over all the pins in one slow motion. Tip will pick up some excess tin and deposit it onto the next one which could use more. In addition to the excellent suggestions already provided. Solder bridges are a fact of life even for the most experienced tech. I find that cleaning the iron tip and then drawing the bridge away in a perpendicular motion to the IC (parallel to the pin/pad) is most effective for me. Oh and regardless of how much flux you use, always clean it afterwards, even the "no clean" flux. Your boards will be much more reliable and long lived. As pointed out, you can clean that up afterwards. Just be sure to put some solder on the desoldering wick first. Lead-based solder has much lower melting point so it's easier to work with. That's obviously quite toxic so don't chew on it or leave it where kids have access to it. Solder joints are obviously pretty inert so handling it is ok. The fumes from soldering that normally reach your nose are not dangerous, it's mostly flux. Heavier than air part is the bad stuff so do not use a fan to blow the smoke all over the room. You would likely benefit from a decent magnifying lamp. 5x lamp makes everything bigger so you can actually see what you're doing. They're not that expensive if you shop around a bit. Don't touch soldering iron tip with the solder wire. Heat the pin/pad and touch solder wire to another part of the pin/pad. 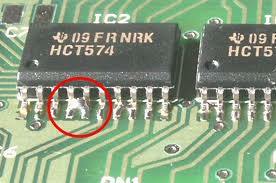 Apply flux on component's pads from PCB. 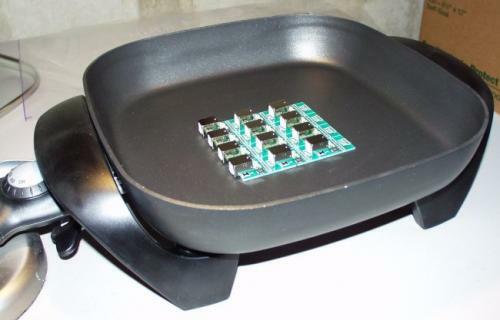 Apply tin solder to all pads with soldering iron. Apply heat with a soldering heat gun (Typically around 15 seconds with 270°C but this depends on the type of tin solder and heat characteristics from the component, which can usually be found on the data sheet). Not the answer you're looking for? Browse other questions tagged soldering surface-mount or ask your own question. SMD solder failure due to probing? How to solve it?